Mustang owners worldwide will welcome the new-world V-6 engine for the Ford Mustang. The ancient 4.0-liter SOHC V-6 truck engine that was the base engine for the Mustang for years will finally take its place in history this spring when Ford introduces the 2011 Mustang with a brand-new V-6. To get the skinny, MM&FF sat down with engineers Greg Johnson, Al Cockerill and Jim Mazuchowski at Ford’s powertrain headquarters in Dearborn and we came away with all the details on the new engine, developed from start to finish in only 36 months. Most importantly, the new Duratec 3.7-liter V-6 enginemakes 305 hp at 6,500 rpm and 285 lb-ft of torque at 4,250 rpm, and is guaranteed to get 30 miles per gallon on the highway, or 480 miles per tank. By comparison, the old 4.0L was rated at 210 horsepower and 240 lb-ft of torque. In terms of power efficiency, the new engine makes 82.5 horsepower per liter of displacement, versus the old engine’s 52.5, a 57-percent improvement-and it weighs only 41 pounds per liter of displacement versus the old engine’s 101. Compare the old 4.0 V-6’s 1.93 pounds per horsepower to just under 1.2 pounds for the new engine. Fuel efficiency is almost 5-percent better overall, from 0.521 pounds per horsepower per hour down to 0.498. Powering the base 2011 Mustang is the new all-aluminum V-6 producing 305 hp and 285 lb-ft of torque. Ford also says it’s as much as two decibels quieter in operation throughout the rev range, which is not to say it doesn’t sound angry and powerful when provoked. We’ve heard it run in the new Mustang, and it sounds great! A 3.7-liter V-6 engine (95.5mm bore and 86.7mm stroke) was used previously in some of Ford’s transversely mounted front-drive crossover applications, but now it has been turned into a longitudinal rear-drive engine for the Mustang that is all new except for the forged steel crankshaft, connecting rods, and a few small parts. It features new heads, a new heavily ribbed and reinforced cylinder block, 10.5:1 pistons flycut to make room for the valves at maximum lift, new front cover and accessory drive, new composite intake manifolding, and especially the new valvetrain. The 2011 V-6 will utilize a cold-air inlet system to enhance horsepower and torque. This new engine is 41 pounds lighter, 20mm less tall, 30mm narrower, and 55mm shorter-far smaller and far more powerful than any base engine ever offered in a Mustang. For starters, it’s a 60-degree engine, so it’s narrow. It’s also all-aluminum as far as the block (which uses cast-in iron cylinder liners), cylinder heads and covers. The forged crank is held in place by six-bolt main bearings, four down and two at right angles on the sides of the block-like a proper race engine. A lightweight aluminum block shaves pounds and helps the V-6 achieve upwards of 30 mpg. It uses four valves per cylinder and double-overhead camshafts, and not only that, the enginefeatures what Ford calls Ti-VCT, variable valve timing on both intake and exhaust valves, a feature that allows a full 60 degrees of cam timing adjustment on the intake side and 50 degrees on the exhaust side, allowing the 3.7 to produce huge amounts of power, very clean emissions, a very smooth idle, and excellent fuel mileage all at the same time. The Duratec 3.7 V-6 is actually what the engineers call a “mild Atkinson-cycle” engine, where the variable intake valve mechanism keeps the intake valve open much longer than in a standard engine for better mixing in the chamber, thus reduced pumping work and better fuel economy. The 60-degree V-6 sports 24 valves and twin-independent camshafts with variable valve timing. 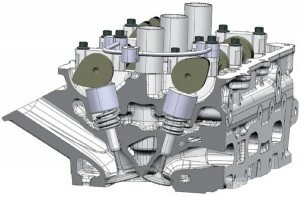 The new cylinder heads use an intake port design that is much higher and more direct, allowing the 29-lb/hr sequential fuel injectors to shoot fuel directly at the back of the intake valves when they are closed, or under high-load operating conditions, spray fuel into the chamber when the valves are open, to reduce knock. The intake manifold is 100 percent composite to keep cost, weight, and noise down, and it’s fitted with a 68mm throttle body-5 mm larger than the previous design. Because the enginehas variable intake and exhaust valve timing, there is enough freedom built in so that the engine doesn’t have flaps or valves built into the manifold for low-speed/high-speed operation. On the exhaust side, there are two high-silicon molybdenum cast iron alloy manifolds leading to the catalytic converters. The new valvetrain uses what Ford calls a megacap, a front cam bearing cap on each bank that manages oil flow to the variable cam-timing sprockets and down through the four hollow camshafts to the other cam journals and the rest of the valvetrain, a brilliant solution. Under those two Nylon 6 noise-abating cam covers, the valvetrain uses very highly polished, mirror-finish, direct-acting bucket tappets between the camshafts and the valve tips, each one computer-selected for fit and clearance, a move that takes a tremendous amount of friction out of the valvetrain and accounts for almost a one percent fuel economy improvement all by itself. Using direct-acting bucket tappets instead of roller finger followers or single-overhead cams, like some other Ford engines, saved 30 mm in overall engine height, an important consideration for cars with low hoodlines. The Duratec 3.7 V-6 uses a deep-sump oil pan that helps provide 10,000-mile oil-change intervals. Each hardened tappet has a very slight crown in the surface, about 15 microns from side to side, to work better against the surface and metallurgy of the drilled-out hollow camshaft’s lobes. Inside, the new engine uses piston-cooling oil jets mounted in the die-cast aluminum block that allows a higher compression ratio and a greater amount of spark advance for power production. With check valves in place, the cooling jets work only when the engine is hot and highly stressed. And, speaking of oil, you won’t have to reach for the left-front-mounted oil filter or drain the sump of the die-cast deep-sump aluminum oil pan of its 5W-20 oil for 10,000 miles, a 33-percent improvement over the usual 7,500-mile interval. This is an advantage brought about by continuous analysis of driving cycles (Ford says almost all of its engines will be 10,000-milers by 2012). Variable cams operate on polished buckets to reduce friction, and increase power and durability. The whole front-end accessory drive or FEAD has been redone in the conversion from east-west installation to north-south, so the engine now uses what Ford calls a stretchy FEAD, with no idlers or tensioners to rob power from the engine, for the air conditioning compressor, and a second belt and tensioner to drive all of the other pumps. The cooling system has been completely re-engineered to put the thermostat and water pump at the front of the engine, and the coolant fluid flow has likewise been re-engineered with a minimum of exterior plumbing. Ford also worked outside the engine to make the package a better fit for the Mustang. The powertrain ECU has been upgraded with a very aggressive deceleration cylinder shutoff for fuel economy, coupled with very rapid tip-in for street performance. On the flip side, the ECU has been reprogrammed with adaptive-knock spark control. If the two knock sensors embedded in the cylinder block don’t hear knocking, the ECU will keep advancing the spark until it does. Finally, the V-6 Mustang gets dual exhaust! What this means in performance terms is that, if the owner uses premium or race gas on weekends, the engine should make considerably more power and torque than the numbers quoted here, which are the product of standard SAE dynamometer laboratory testing procedures and not real-world driving. The new engine will be packaged together with either a six-speed MT-82 manual transmission with needle bearings on all of its shafts for friction reduction, or with a 6R-80 wide-ratio automatic transmission that will allow 7,000-rpm upshifts and torque converter lockup in Third through Sixth gears for improved fuel economy. Every 2011 V-6 Mustang will be sold with electric power-assisted steering (EPAS) for further fuel efficiencies, and Ford promises that the steering will be of a far sportier nature than other EPAS systems. What’s the next step? Well, give it a couple of years, and you will likely see an EcoBoost engine coming along, a twin-turbocharged, direct-injection version of this engine as a viable performance alternative to the current 4.6-liter V-8 engine. The 2011 Mustang, while not all-new, will carry a host of improvements, upgrades, and updates inside and out. Outside it will have new blind-spot mirrors, 4-percent better aero performance around the nose, with a new underbody shield and wheel spats, and standard dual exhausts regardless of engine choice. Underneath that shiny sheetmetal there will be chassis improvements, including stiffer suspension arms and bushings, larger front and rear stabilizer bars, rear wheelhouse liners for noise control, lower-rolling-resistance tires, the same brakes as the 2010 GT on the V-6 versions, a new Z-brace to reduce cowl shake, a standard strut-tower brace on all models, and electric power steering on all models for improved mileage and less drag on the engine. Inside, there will be new rear headrests, more in-dash sound insulation, the addition of the MyKey option and new instrument panel graphics, and lighted visors with a new flexible storage system for sunglasses and other items. A new instant-start system requires one quick flip of the ignition key. Options will include a Pony package, a Mustang Club of America (MCA) package, and a Performance package consisting of GT suspension, upgraded brakes, 19-inch wheels and summer tires, and a looser yaw-control calibration.